BOSTON, MA -- February 6, 2008 ? Neurala LLC (http://www.neurala.com) today posted results confirming that its Synapcard? technology platform can run parallel distributed algorithms up to 230 times faster on a GPU than a single core CPU implementation. The Synapcard? development platform enables researchers and developers to take advantage of the parallel architecture of GPUs and multi-core CPUs for implementing computationally intensive algorithms. A patent application for this revolutionary platform design was submitted in 2007. "Our vision is to realize the full potential of applications of brain-based models in both scientific and business communities throughout the world by using state-of-the-art parallel programming technology" said Massimiliano Versace, CEO of Neurala LLC. "Neurala focuses on innovation and developing strategic partnerships aimed at helping users to harness the power of parallel processing in an inexpensive and easy to use software development platform." Neurala is a Boston-based start-up technology company founded by two graduates and one current graduate student of the Boston University Department of Cognitive and Neural Systems (CNS) at Boston University. In collaboration with CNS and the Department of Geography and Environment at Boston University, Neurala has recently submitted a Small Business Innovation Research (SBIR) proposal to field-test its state-of-the-art technology in a Geographic Information Systems (GIS) and Remote Sensing application: wildfire detection and risk assessment. 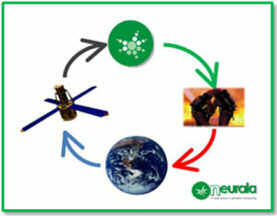 This project is key to illustrating the impact that Neurala?s technology.